Each year we are presented with a new wave of minimalism. Our lives are full on, cluttered and constant. As a result we desire a sense of stripped back clarity. Each year we are presented with a new wave of minimalism. Our lives are full on, cluttered and constant. As a result we desire a sense of stripped back clarity. As this desire for all things simple continues to grow, we are noticing more elegant and refined executions in our stripped back world. There is a bold sense of confidence that is inherent in true simplicity as visual worlds and products have nothing to hide behind. Today’s world of simplicity is an evolution of minimalism and presents more controlled and refined detailing alongside clean, minimal materials and forms. Controlled geometry, engineered detailing, refined material use and dimensionality in digital design are all championed. Only the crafted and truly considered succeed in the world of pure simplicity. Products and design pairs back, laying everything bare. As a result, colour, finishes, textures and slight details speak volumes. Simplicity means that one or two key features are designed to really shine. Whether it is a pop of colour, the texture of a material or the line of a curve, the subtlest of features and details are heroed. Simplicity exposes everything. This poses questions around purpose and use. What’s the role of this product in our busy lives? Does it make our world better? We see products embrace modularity, offering multiple uses and functions that mean people can invest in less or more to adapt to changing needs. The ‘right of purpose’ is key, meaning the best products have a true reason for being. 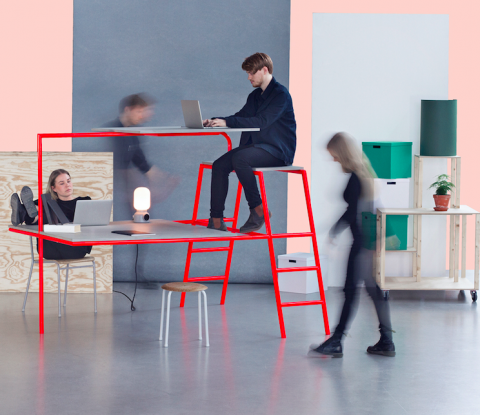 An example of this comes from students from the Lund University who have collaborated with the co-founder of Danish Brand Hay to produce a range of experimental office furniture especially for small scale workplaces. These desks champion multi-purpose use in the beauty of modularity as well as championing angles and shapes created by space. Fast Fresco is a great example of graphic design packaging that uses simplicity to champion the goodness and quality of the product. Typography, photography and iconography is refined, celebrating the product it encompasses. Here, simplicity also showcases its multi-sensorial quality creating a richness as well as purity. We see new worlds in dimensionality. Semi-flat designs add depth and intrigue. A sense of exaggerated space is championed. Subtle differences in colour tone, fading and shadowing finishes create an appreciation of material texture and flatness vs depth. We see this through Google’s ‘Quantum paper’, which considers digital design in terms of surfaces, embracing shadow and depth. Today’s simplicity is about celebrating and championing intricate details. Every detail has an important role to play meaning products and brands can be clearly identified through the smallest of bespoke craft in the detail. What this means for packaging? Be bold. Design has to have the confidence to expose all of its elements completely. Celebrate the intricate details. Whether colour, texture, finish, shadow, depth, lines – you will be known for these touches. Have purpose and make lives better. True minimalism makes a statement about the quality of product. It warrants no distraction. Embrace modularity. Quality means products can be used for multiple occasions. Be joyful. Simplicity brings a mental contentedness through its visual world.